Children are one of the biggest blessings we receive from God. They are also one of the biggest responsibilities we receive from God. As your kids (and mine) get older they will feel a need to belong and be valued. This, my friends, is a big crossroad that needs to be traveled carefully. If you are not spending time with your kids, they will find value in themselves from anyone who will be their friend. This may include anyone from drug dealers to school bullies to anyone who loves chaos and trouble. Your precious little ones have been blessed with gifts and talents that the Lord has given them. You need to be involved in their lives to help them mature in their gifts properly, so that in adulthood they will be shining beacons of light for Jesus! 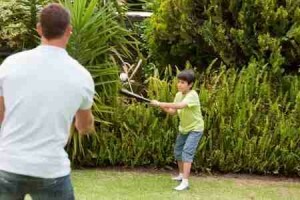 Here are some practical tips you can use to help guide your kids into discovering and excelling in their gifts. The key isn’t just learning to play, but to spend quality time with Johnnie in the process. One of the biggest mistakes we can make as parents is to discourage our kids. Never make your children feel bad because they aren’t good at something. Sometimes it takes practice before they can achieve success. Michael Jordan, the biggest and best NBA player of all-time, didn’t even make the basketball team his sophomore year of high school. Can you imagine how things may be different had MJ’s parents not let him try out for it again? You never know what skills are waiting to blossom in your kids. Encourage your kids to keep trying the things they are interested in. Give your kids specific Bible verses to take with them in their times of struggle. For the older kids use 1 Timothy 4:12, “Let no one despise you for your youth, but set the believers an example in speech, in conduct, in love, in faith, in purity.” They can rise above the negativity of the world and make a difference! For the younger kids use Philippians 4:13, “I can do all things through Him who strengthens me.” Your little ones can face challenges they think are too big if they know you are supporting them all of the way and that God is giving them strength at the same time! Always encourage your children. You both may be amazed at the gifts they discover they have along the way through encouragement. This is one of the most important things you can do for and with your kids. Pray specific Bible verses with your children. Pray Matthew 21:22, “And whatever you ask in prayer, you will receive, if you have faith.” Your kids will really grow with God when they believe this verse and see how God blesses them with gifts and skills. Pray James 1:5, “If any of you lacks wisdom, let him ask God, who gives generously to all without reproach, and it will be given him.” God will show your children what they will be good at if they ask for wisdom in it. Pray Proverbs 3:5-6, “Trust in the Lord with all your heart, and do not lean on your own understanding. In all your ways acknowledge Him, and He will make straight your paths.” Your children will grow in their faith as they start seeing the path open up for them in what they are good at. Our God is always faithful and when we pray to Him, in faith, BIG things happen! Wherever you are in your journey with your kids, it is never too late to help them discover what they may be good at. I hope these tips have helped you get an idea of where to start. Our children are only with us for a short time. Don’t miss out on one of the best stages of life! God bless you as you continue to live a life worthy of the calling! Next post: Why Do Christians Say Amen?